How to make the MP3 songs I love as my iPhone ringtone? Many people who are tired of the old ringtone may have this question. 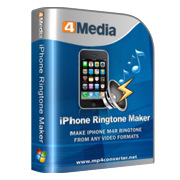 4Media iPhone Ringtone Maker helps you convert MP3 and other video/audio format files to iPhone m4r ringtone and transfer to iPhone easily. 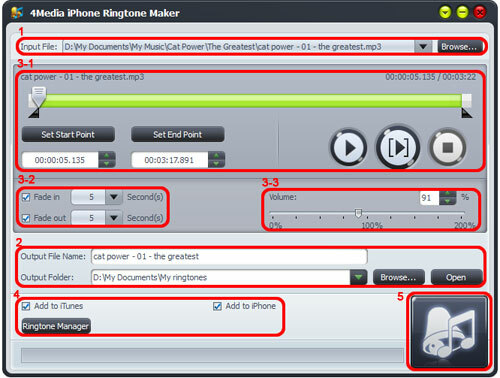 How to convert MP3 to iPhone ringtone? Click the "Browse" button to load the MP3 files on your computer into the software. 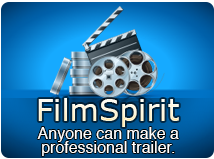 Click "Play" button to listen the MP3 and find the part you want. Drag and drop the start & end sliders to get a music clip, or click "Set Start Point" and "Set End Point" buttons to extract a clip when the player comes to the points you want, or type the start & end time directly in the corresponding text boxes. Check the "Fade in" and "Fade out" checkboxes, and set the fade-in and fade-out time according to your need. Drag the volume slider to set the ringtone volume freely. Before MP3 to iPhone ringtone converting, you can set "add to iTunes (If you have installed iTunes)" or "add to iPhone (Make sure you have connected your iPhone to computer)" option then transfer the finished ringtone to iTunes or iPhone directly. Click the button to start converting MP3 to iPhone ringtone. If you choose the "add to iPhone" option in step4, then the converted ringtone would auto be transferred to your iPhone directly when conversion finished.